Fighter practices are held almost every Sunday in Golden Gate Park on 47th Ave just off Fulton Street, starting at 2 PM. Here’s a link to the practice site. Our practices are teaching practices and new fighters are welcome. We prepare you to pass your safety authorization by teaching you the rules and the basics of combat and helping you get your kit together. As an authorized fighter, you are free to enter tournaments (single combat) and to serve the Kingdom in time of war as a member of a war unit. Experienced fighters are always welcome at our practices. Your advice and experience help both our new and experienced fighters improve their skills. Practice may be canceled due to conflicts with major events or weather so please check our Facebook page for the latest information. Practice is “on” unless specifically canceled. 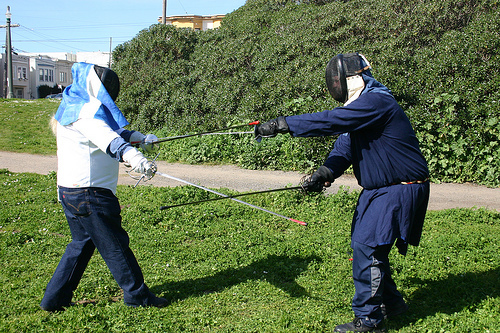 Fighting with two swords (known as “case”) is just one of the styles of rapier combat you can learn. SCA Fencing is a style of historical fencing in which participants study, replicate and compete with styles of rapier sword-fighting found in Europe during the Renaissance period, using blunted steel swords and a variety of off-hand defensive items. It is a great style for beginners as the armor is minimal and the basics easy to learn. As your skills improve you can aspire to be a Master of Defense, the equivalent of a knight. 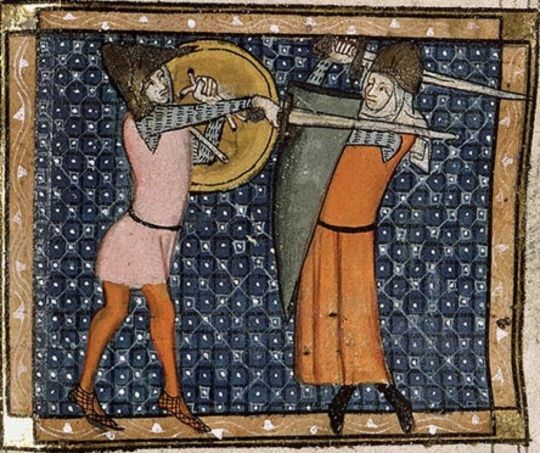 A fighter armed with a great sword challenges another using sword and shield. 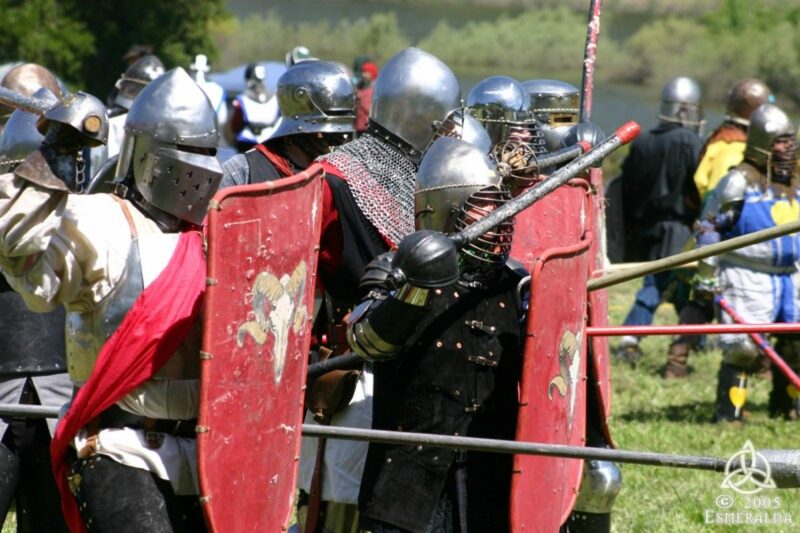 SCA heavy combat is based on the style of fighting done in the high Middle Ages. 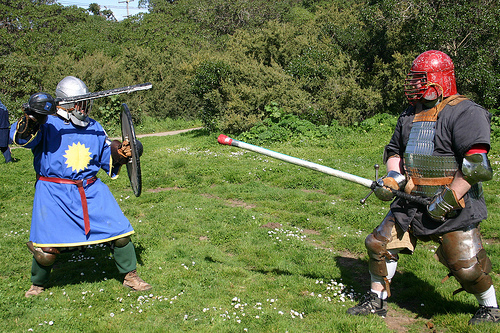 Combatants wear full armor and fight with rattan weapons. Combat is done at full speed and full contact. The training is demanding but the rewards are great: you can win the right to rule as King, Queen, Prince, or Princess or be selected for knighthood. Loaner equipment is available for both combat styles. You will need close-toed shoes, a long sleeved shirt, full trousers or sweat pants, and groin protection. Gloves are not required but if you have them you may want to bring them. You will need to sign a waiver before training. If you’re a minor, a parent or guardian will need to accompany you and sign the appropriate waiver. Minimum age for training is 14 for rapier and 16 for armored combat.